Our departure, we don't know when. There is nothing certain in life. Nothing. The only certainty in life is DEATH. Do we know when we will be buried? When will we return to the One who created us? Do we know how we will leave this world? The hows and the whens of death are matters unexpected. The expectation is that you will grow old and taste death when you are "old". That is what everyone expects of themselves and the beloveds around them. How old? 1 day old or 90 years old? We do not know. Any day could be our last day. My daughter passed away when she was one day old. One day. The news last night on the missing plane. No words to express my feelings. A lot of us feel a lot of things at different times. Numb. Sad. In denial. Angry. Gloomy. Hopeful. Melancholy. Surreal. There were senior citizens, adults and children on the MH370. Various backgrounds, different races, nationalities and religions. They did not expect that when their beloveds board that plane, they will not reach their destination. They did not expect that it was going to be the last time they are going to see their beloveds. Probably it is not the last time? We have all been praying for a miracle. Ended. But the journey for the family of the beloveds does not end. It will not end. We pray to meet again, if not in this life, the Afterlife. My prayers goes out to those on board, their friends, families and relatives. Each and everyone of them. No matter what background, race or religion. May God forgive them all and reward the ones on board goodness for the suffering that they have to go through. May they receive a beautiful end. (or received). May God strengthen the faith of the relatives and friends who were left behind. To the relatives and friends who have lost someone you love : "May God magnify your reward, and make perfect your bereavement, and forgive your departed." Anyways... I found the above picture on Instagram a long while ago. The pictures hit me on so many different levels. 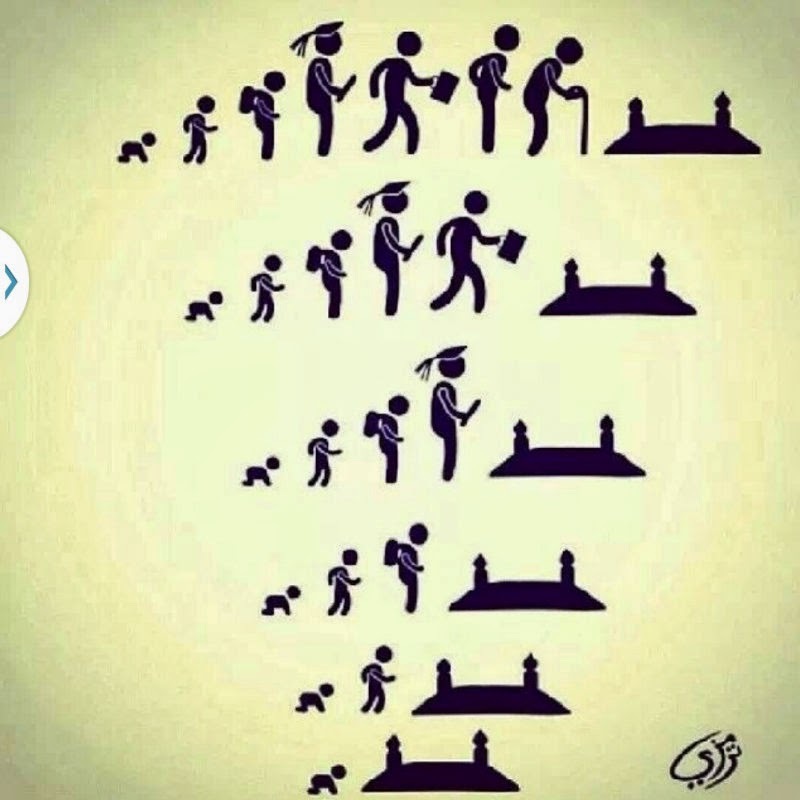 We don't know which stage will we be at when death comes to us. It has been written. Only God knows our expiry date. But, we don't. It could be tomorrow or it could be many years from now. As for my beautiful daughter Putri Jibrael Zumirrah binti Abdullah Khubayb, she's at the bottom level of the picture. No, I did not expect that. My husband too did not expect that her lifetime will be just one day or that we can relate to the bottom stage of the above picture. We did not expect that she will leave this world before us. When I was pregnant. When I gave birth. When I met her at the NICU. I did not expect that it was going to be the last time I get to hold and meet her. Few people told me, oh it is expected. Because of this and that. Everyone trying to be smart or play God. But, we, the parents did not expect it. Oh, and no, no one should play God. A piece of advice. Don't do that to a family who just lost someone. Don't act as though you know the cause of someone's death. There is only One God and only God knows everything. The same day she was born after a long fight living in me without amniotic fluid, she was buried. She was buried the same day I gave birth to her via c-section. The most beautiful yet traumatic day of my life. Beautifully traumatic. My daughter's lifetime was brief but I will never stop loving her and missing her throughout my lifetime in this temporary world of ours. When I found out I was pregnant, never would I have imagined or expected that my daughter will be in that position. She tasted death before her parents. That position at the bottom most of the above picture. Our first daughter. My parents' first grandchild. My baby. She fought for life. She fought to meet her parents eventhough they were saying that it is not possible at the very early stages. 80 days without fluid. We did not have to go through that to live in this world. She did. She suffered a lot. She suffered more than any of us have to suffer throughout our lifetime till now. My sister Hasanah Hilmi shared a photo quoting Rumi on her IG 3 weeks ago. God is with those who suffer. God love the ones whom He tests. May the pain and suffering that all of us go through bring us closer to the One who created us. She's in a peaceful beautiful place now. Alhamdulillah. :) What a comfort to know that she is in a place we can only pray to go through. May we all join her in heaven. Me and everyone who is reading this. Let's strive and remind each other shall we? I easily forget so do remind me if it seems like I forget. "Surely , God takes what is His , and what He gives is His, and to all things He has appointed a time … so have patience and be rewarded." Life is a gift so let's cherish every second. Let's try to use our time to please the One who gave us life. God knows best. May He determine what's best for all of us. May God forgive us all. May God grant us a beautiful ending. An ending in this temporary life of ours which would lead us to heaven. May God grant us death when we are in the highest state of faith and fear of the only One we should fear. May death reach us at a time when God is happiest with our actions, thoughts and state. May our best day in life be the day when we get to meet our Creator. Panjangnyaa, but im happy to get a chance to experience this and share it to anyone randomly. Salam. FashionValet's IG led me to yours and this blog...I just finished reading all your Expect the Unexpected stories.. i cried.. Subhanallah..
You r a strong one..May Allah showered you with good great awesome things ahead... sesungguhnya selepas setiap kepayahan pasti ade kemudahan..
semoga kamu dan keluarga sentiasa di dalam perlindungan dan rahmat Allah. Amin..
Will definitely keep ur blog in my star list. Now u have become one of the women that inspires me to be better..strong n positive. Alhamdulliah. I thank Allah for leading me to this blog.